Tanker drivers’ strike paralyses loading activities in Lagos – Royal Times of Nigeria. Loading activities at both private depots and the Nigerian National Petroleum Corporation depots in Lagos were on Monday paralysed as Petroleum Tanker Drivers commenced a nationwide strike to press home their demands for enhanced welfare. Correspondents who monitored the strike in Lagos observed that all tank farms in Apapa were empty, without the usual loading of products associated with depots. The Apapa depots visited included Total Oil and Gas, Capital Oil and Gas, NIPCO Oil and Gas, Aiteo Oil and Gas, Sahara Oil and Gas, Conoil, as well as Mobil Oil and Gas. There were no loading activities at present because the tanker drivers are on strike. The drivers were seen in groups discussing, while others were leaving the depots for unknown destinations. Alhaji Taofeek Lawal, the Head, Corporate Communications of NIPCO, Apapa said that all depots in Apapa were empty as a result of the strike. According to him, there are no loading activities at present because the tanker drivers are on strike. He appealed to the National Association of Road Transport Owners, PTD, NNPC representatives and other stakeholders to step in and find a lasting solution to the strike. Meanwhile, Alhaji Tokunbo Korodo, the South-West Chairman of NUPENG had said that the Federal Government’s representatives were meeting with NARTO and NUPENG representatives, to resolve the matter. Korodo said that the outcome of the meeting would decide if the strike would continue or not. He, however, said that there was no distribution or loading of products in any part of the country. One of the depot officials who spoke on condition of anonymity, however, said that the strike was uncalled for. He said that the tanker drivers should have resolved the problem with the truck owners, instead of resorting to go on strike. 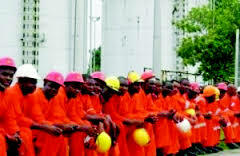 The depot official noted that the country had lost over N20bn to the ongoing strike. The strike was as a result of some unresolved issues bordering on the welfare of workers, such as bad roads, poor remuneration, insecurity and the alleged excesses of some security agencies.